"The Godfather" movies' restoration and release in Blu-ray has been confirmed by the home video mob at Paramount. Welcome "The Godfather: The Coppola Restoration Collection." Update: Full review of the new "Godfather" on DVD and Blu-ray. The revived films -- just released on DVD and Blu-ray in Britain -- return in the States on Sept. 23. "The Godfather" and"The Godfather Part II" were extensively restored. The lightly regarded "The Godather Part III" (1990) remained in excellent condition and so is simply remastered. "Robert A. Harris of the Film Preserve supervised the restoration under the direction of (Francis Ford) Coppola and cinematographer Gordon Willis," Paramount said. Harris' credits include resurrections of "Rear Window" and "Lawrence of Arabia," both widely praised. 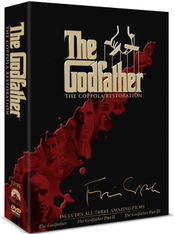 The "Godfather" trilogy Blu-ray set (four discs, $120) includes high definition extra features on the restoration and films' history. They are included on disc 5 of the DVD box set (five discs, $73). Other extras are ported over from Paramount's so-so 2001 DVD release. There are slight differences between the repurposed extras on the DVD and Blu-ray sets, with the HD box having more content. The titles have commentaries from director Francis Ford Coppola, which appear to be the same fine talks from the earlier "Godfather" release (still checking). That's a good thing: Coppola's "Godfather" commentaries added to the already significant body of knowledge and lore attached to them. His comments are focused and instructive, at times stripping away a good bit of the first film's mystique. Paramount Home Entertainment released "The Godfather DVD Collection" (review link) to much excitement in 2001. Individual versions of the three "Godfathers" were released in 2004 and 2005, but they offered no upgrades. Before that, there was an ambitious laserdisc set in 1997. Various laserdisc and VHS packages employed the chronological reworking originally used as a hit TV miniseries. The 2001 DVDs are the original theatrical versions. Enjoyed this post? Get the DVD blog via email. This is fantastic news! Seems like only yesterday that the DVD box set seemed like a big deal. It will be wonderful to see the films restored...once I can afford it, of course. This is well worth waiting for. The "Godfather" films were breathtaking in their original form. Restoration in Blu-ray can only be phenomenal. Outstanding. I hope the collection shows up on Netflix! An offer we can't refuse! My son's putting it on his Bar Mitzvah gift wishlist as we speak -- the perfect rite-of-passage extravaganza for any young man. I envy him! The trilogy's timeless themes are underscored by an essay, Pax Corleone, excerpted in the current Harper's mag, correlating contemporary U.S. foreign diplomacy styles with the temperaments of each of Don Corleone's sons (and consigliere Tom Hagen). SEE: http://www.nationalinterest.org/Article.aspx?id=17008 . Bad reporting. Does "reworked" mean redux like Apocalypse Now? I bought the box set hoping for a huge improvement in picture quality. It said so right there in the box... meticulously restored sound and picture. The 5.1 audio was great. The picture quality was... well, let's just say I was expecting a "star wars" kind of face-lift and got a really good VHS copy quality. The images were grainy at best, had poor black detail on night scenes (especially during the scene where Virgil Sollozo and the Police captain were shot at the restaurant) had a messed up color balance (no, there ain't anything wrong with my TV, DVD player or component cables). Even the 3rd Godfather chapter, which was not restored but "newly remastered", really let down expectations. I own the Godfather box set on DVD before this one came out and I should have skipped buying this new one. Now I don't know how much better the picture quality is on blu-ray, but I really discourage the purchase of these DVDs... unless you didn't have it from before. Francisco -- Thanks for your review. Question: You have the region 2 set? The new U.S. version (region 1) doesn't come out until late Sept. and review copies have not gone out. There was a repackaging a few years ago, but those individual titles had the same audio/video as the older box set. Yup, I bought it here in Oslo, Norway where I am, so it's region 2. Now I don't know if it has anything to do with the devaluation of the US dollar, but if you were to convert the amount I paid for my DVD box-set... it only cost me $45! A bargain if you ask me, but still I would have paid twice as much for the quality I expected. Sounds like you got duped Francisco. Screen & Stream is the new home of DVD Spin Doctor, which has merged with Download Movies 101 at the new site. Please visit Screen & Stream for Blu-ray & DVD reviews -- as well as online video news -- written by bleary-eyed L.A. entertainment writer Glenn Abel.